No amusing story behind this album but one of slight regret. In August of this year, my battalion was getting ready to ship out to the Mediterranean. My one friend got chosen to go on the advance party to meet the ship at Norfolk, Virginia while the bulk of us got boarded at Moorhead City, North Carolina. When I got on the ship there, my friend told me that he saw Journey in concert in Norfolk and how great it was. Needless to say, I was wishing that I had also been chosen for the advance party. 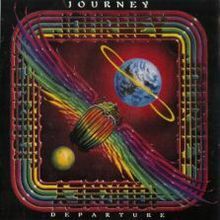 Journey were near the zenith of their popularity by this time and “Departure” was yet another in a string of great albums they had put out. “Any Way You Want It” is the best song known song from the album and it is a rocker as far as singles go. For me, it was definitely a step up from “Lovin’ Touchin’ Squeezin.” The rest of the album just continues the groove. “Walks Like a Lady” is a good follow on from “Any Way You Want It” There are some other good rockers on here like “I’m Crying” and the closer “Homemade Love.” They also go almost experimental progressive in the sense of “Little Girl” which I heard on an alternative version of this album on You Tube and somewhat in the same direction with “Someday Soon” although Neil Schon hammers out a brilliant guitar solo towards the end of that one. I will take a moment to say that thinking retrospectively, Steve Perry was probably the best male vocalist around at the time. He could belt out a rocker and then sing a more ballad like song and still sound convincing. He didn’t and still doesn’t get the recognition he deserves for his vocal talents. Before I end with reinforcing how good the “Departure” album is, I thought I would take a moment to tell you about going to the Stroud Record Fair today. My work with adults with autism was the reason I was there today (my job has its perks) because the gentleman I was looking after likes to collect vinyl albums from artists from the fifties; i.e. Elvis, Buddy Holly, Eddie Cochran, Fats Domino etc. So while he was fishing through those albums, I had a look around myself and saw some cool things like a Thin Lizzy Box Set, loads of Dead Kennedys albums on vinyl and there was a Hanoi Rocks CD that caught my eye too. It was a shame that I only had company money on me. 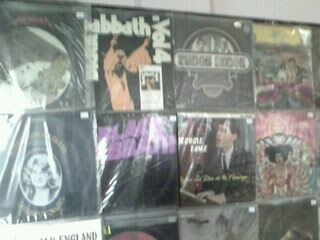 My service user, Jonathan, ended up buying albums by Billy Fury, The Drifters and Little Richard. I didn’t see this Journey album there either and that’s a shame. I first came by this album back in 1980 in what for me was rather unusual fashion. In December of said year, I was on liberty in Naples, Italy often referred to by American sailors and marines as the grease pit of the Mediterranean. Not to offend any Italians who may be reading this but it’s not the cleanest city I’ve been to and if you want to see your life flash before your eyes, then take a taxi. I only saw one traffic light in the whole of the city. Well, two marine buddies and I were letting our hair down in the city, (it was our first port call after leaving the Persian Gulf) so we went a bit wild. We began partying with this Englishman who had just bought this album and one owner of one of the bars we went to let him play it and I must say that through my drunken haze, I rather liked it. Thirty three years later and sober, I still like it, probably even more. Mark Knopfler’s guitar work grabs you on the very first track, “Once Upon a Time in the West” and holds you there. The next four tracks bring you more bluesy guitar work and it reminds me a little of the Grateful Dead or Little Feat. All good tracks and just as you think you’re settling in for more of the same, the sixth track, “Angels of Mercy” changes the tempo and gets you back into it again. A very strong track and I’m pretty sure they played it when I saw them live in 1985. Then you get more of that same blues guitar from Knopfler and co in the next to the last song, “Single Handed Sailor” where the guitar work is reminiscent of the classic “Sultans of Swing.” When it’s all over, you end with a feeling that you’ve just heard an album by a very good band. 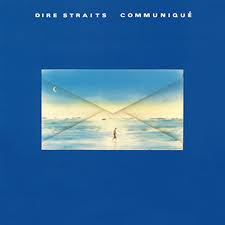 “Communique” to me is a very underrated album, which is why I’m slightly surprised to discover that it got to number 11 in the U.S. charts and much higher in others. For hearing blues based guitar, this album is one of the best, a great gem. 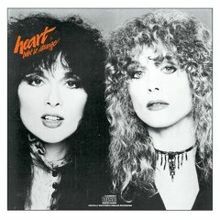 Heart rocked the world throughout the 1970’s with a string of hard rock albums that brought them great fame. Some of those albums have been visited in earlier posts and I stand by my claim that Ann and Nancy Wilson were the first modern rock chicks. 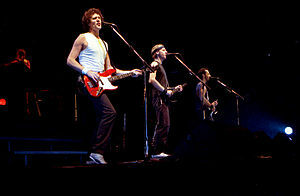 On the flip side, many have said that their 1980 album wasn’t as good as any of their predecessors. True, by this time Heart were engulfed in internal strife and guitarist Roger Fisher left the band some months earlier. However, none of that was reflected on this album in any way in my view. The title track sets the album in the right direction from the outset incorporating everything one knew and loved about Heart. The bluesy “Down On Me” is definitely a likeable track and as always, Nancy gets to show off her guitar talent on the acoustic instrumental, “Silver Wheels.” “Break” and “Rockin’ Heaven Down” are true rock songs even if the former song does kind of end abruptly. This leads fine to the second single “Even It Up” whose rhythm reminds a little of the classic Heart anthem, “Magic Man.” Then you get some more rocking from the next three tracks before the album ends on the ballad, “Sweet Darlin.” So I ask myself after just having had a 38 minute rock out, “What is there not to like about “Bebe le Strange?” I sure can’t find anything. It was a great way to wake up on a Sunday morning! Hearing this album again after so many years gave me such a good rock out this morning and I’ve been feeling the groove throughout the whole day. So what if Heart made this album during their infighting. It proves that once you get down to business, you can still achieve great things. “Bebe le Strange” is an underrated album by Heart and it is definitely worth a listen again. You are currently browsing the 80smetalman's Blog blog archives for September, 2013.